January is the month of New Year resolutions. We promise ourselves to lose weight, to stop smoking, to travel, to start exercising or to sign up for dance lessons, increase the amount of time spend on the dance floor, or to attend our 1st, 5th, or maybe 15th dance competition. However, the most difficult achievement is to motivate yourself to start working on these goals! Let’s face it: we find excuses because we set goals that are unrealistic, not measurable or simply not pleasurable! Remember: it is easier to stick with your New Year resolution if it brings you JOY! Dancing is a joy itself: helps to release endorphins: the hormones of happiness, increases the overall life fulfillment, brings up the positive energy, increases self-confidence and boosts self-esteem! So, don’t just write down in your calendar what you want to achieve in your personal dance career. Act on it! Bring your dance shoes, your passion, motivation, determination and smile, and move your feet in a favorite rhythm! All of us at Dancesport support your passion and your dreams, and will do our best to help you achieve your 2018 dance goals! 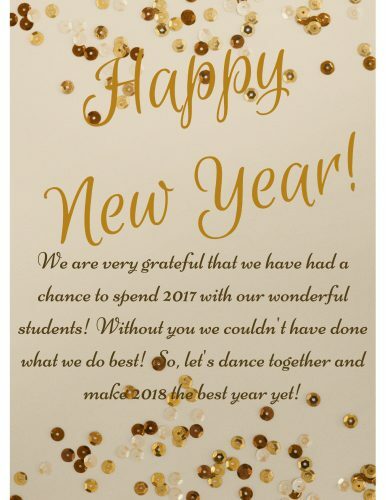 To all of our students, friends, and supporters! We would like to thank you for being with us in 2017. We wish you a wonderful New Year fulfilled with personal and professional dance achievements!